Although these familiar connector designs are adequate for a relatively benign office environments, these products do not offer the ruggedness demanded by the more demanding military environment. The transfer of commercial technologies in to the military domain has seen the increase in the need to use USB, Firewire and RJ45 v connectivity. This speed of change in this area has left the area of connectivity lacking in suitable connectors that are able to support both the data transfer requirements whilst achieving military ruggedness standards. The current response to this requirement has been to package the standard commercial connector in a rugged military proven housing. This solution whilst functional does not allow for manufacturers to reduce the size and weight of their equipment, a common demand from the end user. The usual connectors for common data transfer protocols are designed for use in areas such as simple office environments. Harsh conditions, such as dirt, moisture and countless insertions are not expected here. In order to satisfy the requirements, the connectors are integrated into existing housings. This leads to problems with size, weight, handling and costs. Increasing bandwidth needs to allow faster data transfer mean that the stability of the signal transmission through the connector is crucial. 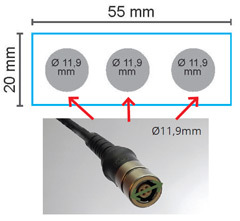 The faster the data transfer, the more important signal integrity becomes, and the less tolerant systems are to impedance mismatch, therefore the need for purpose designed connectors systems. What turns a connector into a high-speed connection? Above all, it is the know-how for details! The choice of the insulation body material demands special attention. The plastic must be co-ordinated to the hard environmental conditions, and also to sensitive high frequency parameters such as a frequency-stable dielectric constant or a low dielectric dissipation factor. Skilled contact arrangement and design and the addition of compensation regions can optimize a connection to the point that it is possible to transmit data rates of up to 10 Gbit/s. Achieving this particularly entails optimization of the characteristic impedance in order to achieve an acceptable return loss. When wiring the contact arrangement, it is just as essential to make sure that crosstalk among the differential pairs is minimized by targeted field control. This allows even CAT 6A quality to be achieved without the necessity of adding an expensive shield plate. 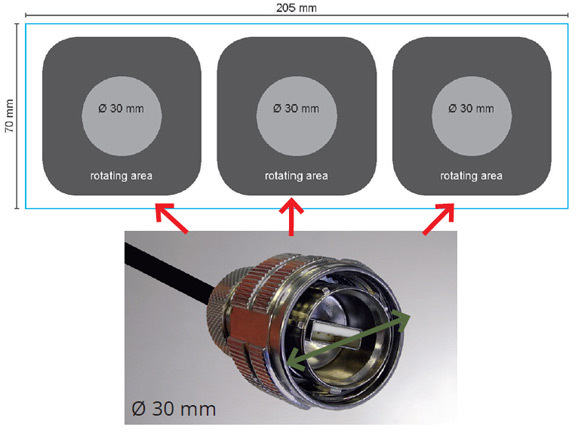 The result at the end of this process: a new ODU connector that fulfills the requirements for the transmission of high-speed-protocols and yet is still suitable for use under the most varied environmental conditions. ODU AMC – Advanced Military Connectors: The next connector generation for high speed military applications. When you needs access to mission-critical applications in voice, high-speed data no matter the environment or conditions. * Controlled electrical data transfer speeds only achievable with push pull and break away connectors (pictures below). ** Easy-Clean, signal and power transfer. ODU is one of the world’s leading connector systems suppliers and employs more than 1,500 people around the world. Aside from company headquarters at Mühldorf am Inn, the ODU Group also has an international production and distribution network in Sibiu/Romania, Camarillo/USA and Shanghai/China. ODU combines all relevant areas of competence and key technologies relating to design and development, machine tool and special machine construction, injection, stamping, turning, surface technology, assembly and cable assembly. ODU connectors are used worldwide in numerous areas and ensure a reliable transfer of power, signals, data and media: in future-oriented growth markets such as medical technology, military and security technology, and energy technology, as well as in established sectors such as industrial electronics, measurement and testing technology, and automotive technology.